Finned Aluminium Valve cover for the 1928-31 Model A engine. These are made for the later style oil return pipe that was 15" on center of the mounting bolts. U.S.A.
Aluminium Engine cover for the 1928-31 Model A engine. To compliment our Finned timing cover, this finned aluminium plate, covers the left side of the engine. Finned aluminum valve cover for the 1932-34 Model B four cylinder engine. 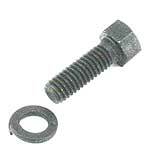 Side cover bolts 1928-31. One short, and one long special dome headed bolt to bolt the timing side cover on. Black oxide. Made in USA. Valve cover gasket for the 1928-31 Model A Ford engine. (Don't forget the oil return pipe gaskets, if you are removing the valve cover). An all new reproduction of the later style return pipe. In May of 29 Ford lowered the location of the upper end of the pipe on the valve cover to help lower the oil lever in the valve chamber. This pipe will only fit the valve covers that have a recessed bolt hole in the pipe mounting area. Black powder coating to resist oil. Ready to bolt onto your car. Bolts and gaskets sold separately. Oil return pipe Gaskets 1928-31. A pair of the gaskets that go between the oil return pipe and the motor. Hard fiber as originally used. Set of 2. Made in USA. 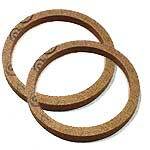 Cork oil return pipe gasket set for the 1928-31 Model A Ford. This is the pair of gaskets that go between the oil return pipe and the motor. Set of 2. Side cover gasket for the timing gear. Made in USA. Timing cover front gasket for the 1928-34 Model A and B engine. Timing cover bolt set for the 1928-31 Model A Ford engine. These are the original dome head bolts for the front timing cover. With the authentic black oxide finish. Made in USA. Timing pin 1928-34. An authentic reproduction of the timing pin for the show car. Made in USA. Timing pin washer 1928. A very thin copper washer for the timing pin. This was only used in 28. Made in USA. Geat item this! After fitting it on your front timing cover using the engine mounting bolt, you can mark top dead centre on your front pulley and use that mark for checking your ignition timing. You no longer have any need to set timing using a pin. I painted my indicator Ford engine green and it looks like it grew there. Made in USA. "Genuine Nu-Rex".